Researchers flock to more developed, wealthier countries, with advanced research systems. The big picture of global migration shows this rather clearly, but it also shows culture can significantly skew this pattern. Yuh Nung Jan and Lily Jan are two married neuroscientists, running their laboratory at the University of California, San Francisco, for more than three decades – enough to study the geography of science world change. Initially, when they started work, they employed locals (9 out of their 11 initial employees were American). 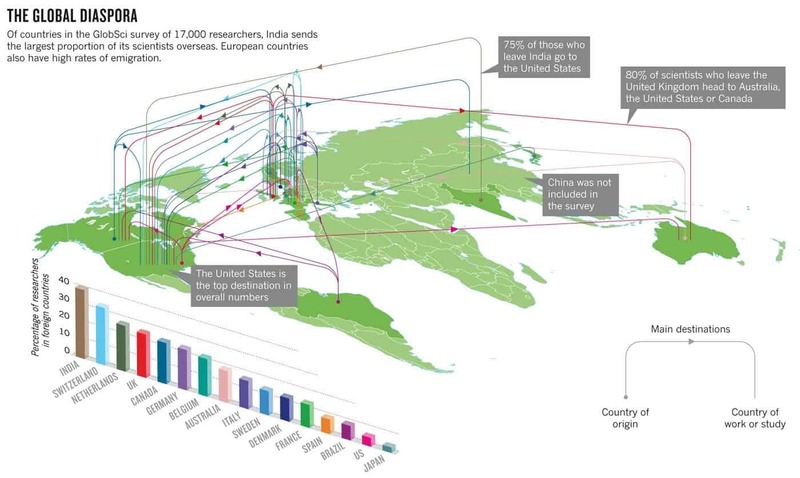 But the Jans, who emigrated from Taiwan themselves in the 1960s have increasingly attracted talents from overseas, and their team now consists of 6 Chinese scientists, 12 Americans, 2 Koreans and one researcher each from Canada, India, Singapore, Taiwan, Turkey and Germany. Their story is not unusual at all. “There is a progressively wider geographical variety of graduate students and postdocs in most leading universities,” Yuh Nung says. As a clear example, 40 years ago, non-US citizens claimed 1/4 of all the doctorates awarded in the US in physical sciences, engineering, mathematics and computer science; in 2010, that number had risen to 1/2. Other developed countries such as Germany, the United Kingdom and Australia have seen similar trends. Basically, you can expect almost 1 in 2 doctorates to be foreign. It seems extremely likely (although hard to prove) that highly productive and financed research systems such as the United States have benefited from this talent import both scientifically and culturally. Being able to patch up any weakness in the homeland education system is of course a great thing for these countries – but any coin has two sides. The (let’s call them) poorer countries are very worried about losing their top minds. In the past 30 years, 1/8 of the most cited and respected researchers were born in developing countries, but over 80% of them moved to richer countries, mostly the United States. India is a perfect example in this case, but other countries, such as Romania and Taiwan are also great examples. Much like other things, science has become a global marketplace, one in which countries with well-funded and dynamic research systems take the spoils. However, the global picture of this migration is harder to see than you might expect. A big problem is that most ‘migration’ and ‘mobility’ discussions and studies don’t differentiate between long term and short term (a few weeks or months) relocations. There are so many kinds of mobilities, and people rarely specify this,” says Grit Laudel, a sociologist at the University of Twente in Enschede, the Netherlands. Stephan is one of the researchers which tried to bypass this confusion and conducted the ‘GlobSci’ survey; she and her team interviewed 17,000 researchers in four fields (biology, chemistry, Earth and environmental sciences and materials) in 16 countries about their movements. The result, as they call it, is the “the first systematic study of the mobility of scientists in a large number of countries”. The results showed, as expected, big disparities in proportions of researchers who work in different countries and in foreign researchers. The United States is indeed the most open country regarding this aspect; however, proportionally, Switzerland, Canada and Australia all house more foreign researchers. India was at the other end of the table. The survey did not include China. But on the other hand, India has by far the biggest diaspora, both in sheer numbers and proportionally, followed by, rather surprisingly, Switzerland, the Netherlands and the UK. They also identified other aspects which affect the researchers’ mobility. The stage of their careers was a significant factor, not only in itself, but because researchers who had just obtained their PhDs for example were presumably less likely to be tied down with relationships or families. “One take-away from a policy perspective is that if you are trying to bring people back who have studied overseas, then you should target the young because they are more likely to move,” says Patrick Gaule, an economist who studies science and innovation at Charles University in Prague. Many economists note that the richer a country becomes, the more researchers tend to flock to it, and its own scientists tend to remain in their homeland. But wealth is not the only factor. Dynamic, competitive systems are also a key aspect here. The thing which seems to trump everything else is still a well-funded science system – and this may very well be a good thing. 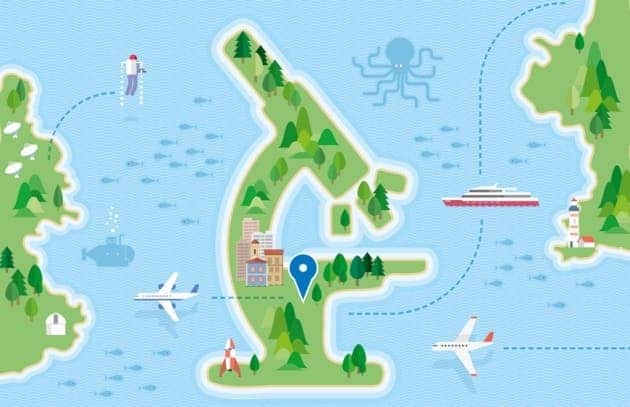 After all, we need to place potent scientists in positions where they can make a difference, and even though the vision of a globalized scientific world is still a long way from happening, scientists will continue to migrate, clumping countries with better research systems, leaving the poorer ones to deal with a very serious case of brain drain.